If you’ve not yet read “I Am, I Am, I Am” – this piece does contain the odd spoiler. 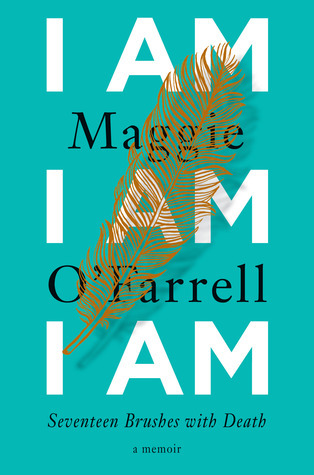 My Hay experience kicked off with Maggie O’Farrell, whose new release is “I Am, I Am, I Am: Seventeen Brushes with Death” a memoir with a twist. First – the structure. Each chapter is a different brush with death and is headed by one (or more) body part, which has some relevance to that brush. As I was reading, there was a most unexpected build-up of annoyance – annoyance with her, our author. Initially I wondered if this came from my irritation with those brought up in ‘safe’ countries who behave in a somewhat frivolous or reckless manner when travelling in countries that are anything other. Except all of these tales weren’t in unsafe countries. But the more I considered it, the more I felt that there was an underlying feeling of self-judgement regarding her behaviour. A somewhat wild and bolting child, then a young woman who felt a drive to get away – I still wondered why there was this underlying negative judgement. Until I read the final chapter. I’ll say no more. Let’s just say she doesn’t need to feel that way, but I understand why she does. A thoughtful (& thought-provoking) read. At Hay, Maggie O’Farrell was talking to Cathy Rentzenbrink – author of The Last Act of Love – also a memoir, one telling the story of Ms Rentzenbrink and her family coming to terms with a horrific accident involving her younger brother Matty. We kicked off with examining what had made O’Farrell decide to write a memoir. The illuminating response “Despite enjoying various memoirs, in particular those of authors, I didn’t want to write it!” (Hilary Mantel and Philip Roth were name-checked as favourites of this form for those who’d like to know). In fact, her usual reaction to any suggestion of writing a memoir was some equivalent of ‘I’d rather stick pins in my eyes’, but that whilst working on a new piece of fiction, she found herself writing longer and longer pieces in her diary. She went on to state this had caused panic attacks, because “I recognise a book when I see one.” As many a writer can stipulate, some books just insist on being written and this – it seems – was one of those. Expressing her tremendous doubt about the worth and saleability of her memoir, we learned that she’d accept no more than a £1 advance on her contract for it. With two primary worries – one of feeling personally exposed, but more concerned of exposing family and friends, O’Farrell expressed how this feeling extended beyond the written word to the inevitable public discussions of the book once published. Secondly, believing it’s tricky to write a memoir and having a natural aversion to writing chronologically, O’Farrell chose instead to write a series of essays; a format she found helped in the leaving out of personal detail and names of family and friends. Asked about her approach, O’Farrell confirmed her preference for avoidance of ‘the throat clearing’ as Ms Rentzenbrink described the talking about the hows and whys and preferring to jump straight in to telling the story. To an enquiry about the impact of her childhood illness, O’Farrell felt she flips between believing it was the most defining moment of her life, and that it had no impact at all – as she still became the person she was meant to be. O’Farrell’s daughter has dangerously high levels of allergies. She described an occasion when she had to beg another traveller on an aircraft not to open a packet of nuts, as that action alone could result in the death of her daughter. Clearly life is lived on high alert, but O’Farrell is fulsome in her expression of gratitude and praise for those who do so much to enable her daughter has as safe and as normal a life as possible. O’Farrell went on to express that one major benefit of writing the book was to demonstrate to her daughter “… who has had more brushes with death than the average 9 year old …” that this is an experience she can share with her mother. Another positive aspect of writing the book was that O’Farrell finally decided to learn more about cerebellum injury (caused by her near fatal childhood illness). She discovered that one outcome is an inappropriate attitude to risk … which gives a very different perspective to her many brushes with death. Another is that it often results in a problem with sequencing … O’Farrell laughed her as she described being horrified to learn this, having always believed her preference for non-chronological writing to be a creative choice! The title of the book came from Sylvia Plath’s Bell Jar “I took a deep breath and listened to the old brag of my heart. I am, I am, I am.” It was hard to avoid the sub-title of this book in discussion, and whilst her childhood illness was a major near death experience, we learned there were others, even more than were included in the book. One reason for being cut was repetition – for example, there was more than one near drowning experience! Lastly, O’Farrell was asked if she had a particular message in writing the book. Believing her life has benefitted from what she called ‘terrestrial angels’ and that her book highlights their presence in life and in the impact they have, one message was that if we see someone who needs help and we can make a difference, we should do so.